Rugged Scott Taylor can't stay away from the stunning Megan. But their powerful attraction could compromise the search for her missing brother and put her in terrible danger. Can the pair survive treachery, betrayal, and their own mistrust? Dani lost the love of her life to an unjust prison sentence but is finally ready to move on. She has no idea her estranged husband is being released. Dex is determined to win her back...but will it be too little, too late? 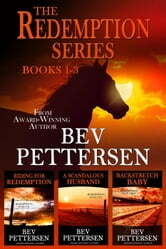 Desperate to keep her horse training job, Eve turns to private investigator Rick Talbot for help. But when she's thrust into danger, will their irresistible attraction be enough to save her life? Really enjoyed all three books. They have varying degrees of mystery and romance with several twists that took me by surprise, including the real villain. Laughed and also choked up in spots, got caught up in the books and the people. Recommend. I loved this boxset. Delightful characters lots of genuine love and real suspense! i loved all the knowledge about the horses.